How do you know if a guy is flirting with you? Use these 20 signs! Want to test him and see if he’s flirting with you or you’re just imagining it? See if he tells you about his family, and while he’s at it, is he running his hands through his hair a lot? Is he blushing? What about his body language? Does he look deeply into your eyes when you talk to him and laugh at everything you say? These are all flirty signs, and may be proof that he is really into you and would like to get closer – both physically and emotionally. See what else you can infer from his behavior. MORE: Is he Flirting With You? Here Are The 8 Signs He Is! The art of flirting is really fun to practice, but at times, it can feel like the guy is playing with your mind, or that you’re just imagining things. 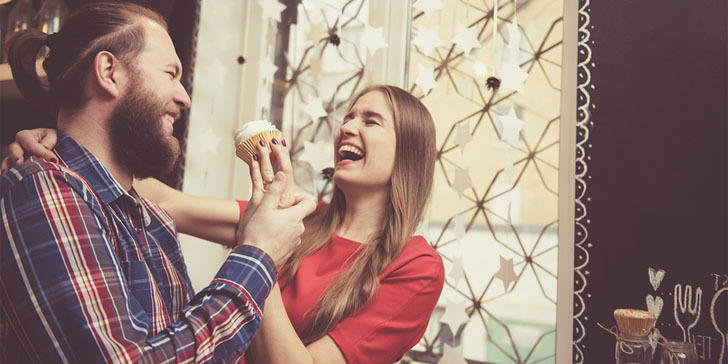 Is he flirting with you, or is it just wishful thinking? 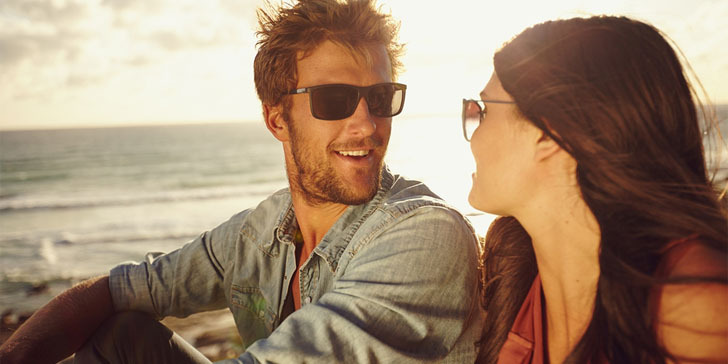 If he’s hot and cold, that can be frustrating and confusing, so let’s take a look at some signs that the guy you like is actually being flirty. You know for sure you’ve never been much of a comedienne, but this guy can’t seem to stop laughing at all the silly jokes you’re making. Have you suddenly become funny, does he just have the same type of sense of humor, or is he laughing at everything you say because he likes you? There’s a chance he just thinks you’re very funny, but he is probably doing that flirty laugh thing, as well. Have you ever paid attention to how he reacts when you tease him back? Does he blush? Does he ever get red while talking to you, or asking you things – maybe personal ones? People, especially men, don’t tend to blush when they don’t like someone. A man who gets all red is not only adorable, but he’s flirting with you. I’ll tell you a secret – that’s how I clocked that my first boyfriend liked me! 3. Is he flirty with everyone? What’s helpful is to determine whether he’s flirty with you, or if he just has a naturally flirty personality. Some people are just flirts and they can’t even tell when they’re doing it. So, to put that nagging feeling to rest, you should silently observe his behavior around other women. Is he as nice to them as he is to you? Does he open up to them the same way? Does he laugh around them and tease them, like he does with you? If that’s not his usual modus operandi, then you might just be special to him. 4. Does he touch you “accidentally”? When we like someone, we want to touch them. We can’t help it; it’s like a magnet. So you find any excuse to touch them “accidentally”, or in any way that’s appropriate – does he do that to you? Keep your eyes peeled: does he touch your hand when he hands you a glass? Does he press his leg against yours when you sit next to each other? Does he ever unnecessarily put his hand on your back or waist to move past you, etc.? Don’t look now, but he’s flirting with you. Think back to your conversations – does he share things with you? Details from his personal life, stories from his childhood, information about his family, and things like that? That’s a pretty obvious sign that he would like to be close to you and he feels comfortable sharing such an intimate part of him with you. He is open with you and that can bring you closer, because he is establishing a different relationship with you than with everyone else. After all, only special people get to catch a glimpse behind the curtain. 6. Does he ask for your stuff? Have you ever noticed him being especially gentlemanly? Does he open doors for you, and is he always ready to offer his coat at a moment’s notice when you’re cold? This is where you’ll have to pay attention and see if he does that for other women as well, in which case it’s just his style. But he may also be trying to “protect” you and be nice to you because he likes you a lot and this is his way of flirting. You know how boys tease and otherwise bother little girls they like on the playground? Let me tell you, they never grow out of it. Boys will always and forever tease the girls they like, even if they’re all adults. So, if he’s always playful around you, fake “mean”, pointing out cute stuff you do, ways in which you’re messy or childish in any way, he doesn’t actually think those are flaws; he thinks you’re adorable and he’s definitely being flirty. Otherwise, why would he be so interested in every aspect of your being? People we like often make us nervous, and it’s pretty adorable. And if you look out for the signs, you may notice that he’s very fidgety around you. He might run his hands through his hair a bit too much, play with a pen, put his hands in his pockets only to take them out again, rub the side of his neck, etc. 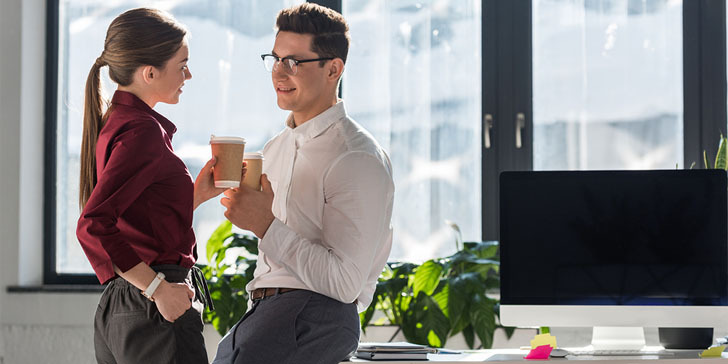 To the untrained eye, these might seem like just normal behaviors, but they betray a certain nervousness that’s really only present in men when they’re flirting with a woman they like. That would be you! 10. Does his job require him to be nice? Another trap to look out for is paid flirts, essentially. When you work as a bartender, a waiter, a salesman – it is literally your job to be as nice and complimentary as possible to customers, in order to get tips or make a sale. And while he may genuinely be a good guy, and may even like you, it’s impossible to tell for sure until you get him outside of his working environment and see if his behavior changes. Is he still flirty with you? Good. Is he flirty with other ladies? No. Score! Lying to get someone to like you is never something I’d advocate, but he might get a pass on this one. Sometimes, we like someone so much, that we’re just eager to find something in common. He loves that you love running, so he enthusiastically nods in agreement – he likes it, too! Let’s go running together sometimes! If you do, you will realize that he probably hasn’t been running since his last gym class, but we can give that a pass, because it’s cute and he had good intentions. You’re not at the stage where he outright gifts you romantic things just yet, so don’t expect a ring, but if he pays enough attention to give you small things he thinks you’d like or need, like a mug with your favorite TV character, a little plant pot for your desk, or even a pen because you’re always losing yours, you know he’s into you and this is one of the ways he’s letting you know. If a guy likes you, he won’t like that you’re going out or hanging out with other men, but he can’t really say it outright. So, he’ll tease you about it. He’ll make fun of them, say they’re gay, mock their looks, and say petty things about them. That’s your undeniable sign that he is flirting with you, right there. It’s a form of teasing, sure, but it reveals some very interesting and real feelings. Does he ever tease you by calling other guys your boyfriend or husband? Does he make silly kissy faces or references a romantic relationship you may have with someone? That may seem casual, or even like he’s not interested at all – after all, he wouldn’t joke about you dating other guys if he was into you, right? But it’s the exact opposite; he’s trying to make it seem casual, but that betrays his desire to be the one who’s dating you. A man who likes a woman will always find a way to give her compliments, no matter how subtle. In his head, he may be thinking about how hot you are and how much he likes you, but he can’t really say that to your face. So, he has to get subtle and flirty with it. Keep an eye out for comments about the way you smell, that you “look nice”, that he likes your outfit, or that he likes your hair done like that, etc. Compliments on your personality count, too, and they’re the best kind. Eye contact is essential in establishing romantic relationships and interactions. 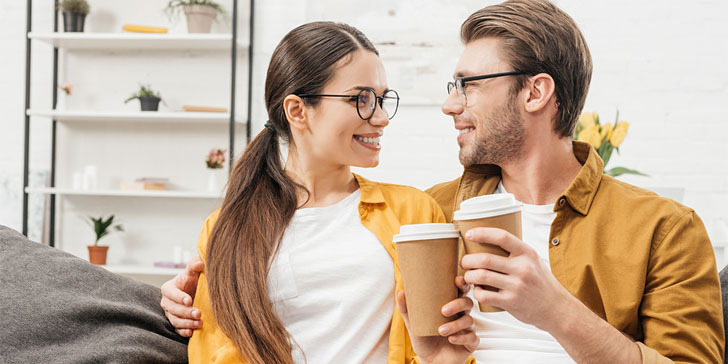 People who like each other tend to stare adoringly into each other’s eyes, and rumor has it you can even “trick” the brain into falling in love with you if you maintain prolonged eye contact with someone. That might be exactly what he’s trying to do. Does he look into your eyes when talking to you? Catch your eye from across the room? Break eye contact with a little smile? Someone is being flirty! 17. What does his body language say? As you may already know, you can tell a lot about a person from their body language. Especially when you’re into someone, your body will betray you. Observe his body and his movements next time you talk to him – does he turn towards you? Are his arms open, instead of just crossed, or any other guarded, defensive stance? Yes, you can definitely flirt with your body, and that’s exactly what he is doing. 18. Does he fuss with his appearance? If he is, indeed, flirting with you, then he is hyper aware of his appearance and the way he looks to you. He wants to look good for you and he’s probably a bit worried about how you perceive him. So, maybe without even realizing it, he will fuss with his hair, smooth out his pants, make sure his shirt isn’t wrinkled, etc. He wants to look good when he’s flirting with you. Next time, make a comment about it or compliment his appearance; he’s probably going to blush. 19. Is his face honest, open, and welcoming? This also falls under body language, but his face can also give you an indication of whether or not he likes you and if he’s flirting with you. Try to be subtle about it, but scan his face for biological indicators that he likes you – his lips might be open, his face can be a bit flushed, maybe his nostrils are flared, his eyebrows raised, and his eyes wide open. A guy will want to seem as manly as possible around you, so if he’s flirting with you, chances are he will use some sort of small artifice, like lowering his voice to sound more grave and masculine. He wants to appear attractive and impress you, and if that’s not flirty, I don’t know what is. a guy who wants to flirt always make eye contact. this is accurate and true almost all the time. he wants all your attention and that you wouldn’t miss anything he does to you. bear in mind that it is very important to read these situations properly. he can just be pure friendly. just saying. these signs are definitely accurate. you only need to be really aware of your man’s actions to know and when you know, try doing the same! thank you for these tips! your article will let me know for sure if the guy that i like is flirting with me. sharing it now! these are funny but really cute! you are right and men are really like this when they’re flirting. well, this guy is just friendly but the more we spend time together, the more i see and feel that there is something more than that. i don’t want to misread the situation i am very much thankful i saw this post. take note that every person is different and can flirt differently. if you really want to make sure if someone is flirting with you, look at their eyes because eyes don’t lie and can’t hide feelings! when he teases you or jokes about you relationships or guys you’re seeing, he might be flirting with you. this means he likes you but is too afraid to ask you directly. i love how this guy flirts with me. he teases me in a sweet way and i found it very cute! aside from constantly trying to impress me, he also loves hearing about what is going on with my life. oh i love this! i could really see some of these signs from this guy i met a few months back. i’m really into a different guy but this one shows more effort and he’s really nice. see how he acts around women. if he talks or treats them the same way with you then he is not actually flirting with you.. he is just naturally charming, that’s it! this is a nice read. maybe it is not too obvious but i just don’t notice when someone is flirting with me. i am thankful i read this article. now i have a good idea what flirting is! haha! hmmm, this is a good read. we all know that flirting can just be for fun. we should all be cautious because girls easily fall in love. take note that it doesn’t always mean that a man is looking to get on a relationship with you if he flirts with you. maybe he is just feeling good about himself or just being nice. exaggerating what you both have in common is really subtle but big sign he’s trying to flirt and get your attention. all other signs on this list though are really good too. hmmm, i never really paid attention to how he reacts when i tease him back, maybe he was blushing i just didn’t notice it. all i know is he always look at me in the eyes and not around the room. i loved reading every bit of this article! thank you for sharing this, it made me smile knowing that i am with a man who gave me all sorts of emotions from the beginning until now. i love this list! thanks for sharing it. i just needed a few more to confirm if this guy’s really flirting and interested in me or just playing around. this is very timely! i really need tips on how to read a man’s body language to know if he is flirting with me or not! this website rocks! i will keep this list in mind. thanks! if he starts blushing and trying to really get close to you, he might be sending you the message. but don’t get too jumpy, check all other signs and find out how he really feels or thinks. these are clear signs! thank you so much for making it easier for me to determine if he is flirting with me or not. reading this made me smile and really feel good. i think this guy at work is flirting with me and i see some of these in him. i hope he continues to do so bec i kinda like him too. this has always been my problem when it comes to dating. i can’t tell if a guy is serious or just flirting with me. i will definitely use these signs. thanks a lot! a man who teases you so often is definitely flirting with you! men will even tease you with other guys..but don’t get him wrong, this sometimes only means he is really into you that he wants to know if you’re interested with some other men or not. i wonder if this guy is flirting with me or just being nice to me. he asks for my number and always shower me with compliments! well, it can be really difficult to tell if someone is flirting with you. thank you for this wonderful article. i now know how to recognize the subtle signs of flirting. ahahaha! i remembered someone when i read this article; a guy who always laughed at my “not so funny” jokes. it was really obvious that he was flirting with me. i knew that i am special to this guy because he always shares personal details with me. even if i don’t ask for it. i appreciate the fact that he trusts me but i wish he could tell it to me straight that he likes me. i really like this guy and i hope he feels the same way but i don’t have any idea how to tell if he is also into me. thanks for this article. i will definitely watch out for these signs. wish me luck!